For other uses, see Ganzhou (disambiguation). In 201, Emperor Gaozu of Han established a county in the territory of modern Ganzhou. In those early years, Han Chinese settlement and authority in the area was minimal and largely restricted to the Gan River basin. The river, a tributary of the Yangtze via Poyang Lake, provided a route of communication from the north as well as irrigation for rice farming. During the Sui dynasty, the county administration was promoted to prefecture status and the area called Qianzhou (虔州). During the Song, immigration from the north bolstered the local population and drove local aboriginal tribes further into the hills. After the fall of the capital to the Jin in 1126 in the Jingkang Incident, immigration increased dramatically. The province's name was officially changed to Ganzhou during the Southern Song (1127–1279). During the late 1800s Ganzhou was opened as one of the southern treaty ports and became a minor base for foreign companies. Between 1929 and 1934, Ganzhou formed a part of the Jiangxi–Fujian Soviet, one of the bases of the Communist Party of China. Due to its proximity to the Red capital Ruijin, Ganzhou was subject to a number of Kuomintang encirclement campaigns. Between 1939 and 1945, Chiang Ching-kuo was appointed by the Government of the Republic of China as commissioner of Ganzhou Prefecture (mountain South), then the name of the surrounding regions of Ganzhou. There he banned smoking, gambling and prostitution, studied governmental management, allowed for economic expansion and a change in social outlook. His efforts were hailed as a miracle in the political war in China, then coined as the "Gannan New Deal" (贛南新政). During his time in Gannan, from 1940 he implemented a "public information desk" where ordinary people could visit him if they had problems, and according to records, Chiang Ching-kuo received a total of 1,023 people during such sessions in 1942. In regards to the ban on prostitution and closing of brothels, Chiang implemented a policy where former prostitutes became employed in factories. Due to the large number of refugees in Ganzhou as a result from the ongoing war, thousands of orphans lived on the street; in June 1942, Chiang Ching-kuo formally established the Chinese Children's Village (中華兒童新村) in the outskirts of Ganzhou, with facilities such as a nursery, kindergarten, primary school, hospital and gymnasium. Ganzhou has a humid subtropical climate (Köppen Cfa) affected by the East Asian monsoon, with long, humid, very hot summers and cool and drier winters with occasional cold snaps. The monthly 24-hour average temperature ranges from 8.2 °C (46.8 °F) in January to 29.4 °C (84.9 °F) in July, with an annual average of 19.42 °C (67.0 °F). The average annual precipitation is 1,460 mm (57 in). With monthly percent possible sunshine ranging from 20% in March to 62% in July, the city receives 1,778 hours of bright sunshine annually. Winter begins somewhat sunny and dry but becomes progressively wetter and cloudier; spring begins especially gloomy, and from March to June each of the months averages more than 180 mm (7.1 in) of rainfall. After the heavy rains subside in June, summer is especially sunny. Autumn is warm and relatively dry. According to the official website, there are 8,361,440 people living within prefecture limits. More than 99% are Han Chinese, and 71,200 people belong to 41 minority ethnical groups (mainly She, Hui and Yao). 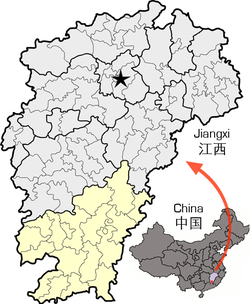 Ganzhou also contains the largest Hakka community in Jiangxi, with a significant population that speaks Hakkash. Hakka architecture: Some of the most representative Hakka houses include Guanxi Xinwei (关西新围) of Longnan; Yanji Wei (燕翼围), of Yangcun (杨村); Longguang Wei (龙光围) of Taojiang (桃江); and Dongsheng Wei (东生围) of Anyuan, etc. Dongjin Bridge: Pontoon bridges have been constructed over the Zhang and Gong rivers since the Song Dynasty. The Dongjin Bridge is one that can still be seen. It is 400 metres long, made up of wooden planks placed on around 100 wooden boats linked together with iron chains. Zao'er Alley (灶儿巷), Zhanggong District: Zaoer Alley is a magnificent cultural heritage of the world, with a length of 218 meter. Zhanggong has a city wall dating to the Song Dynasty, as well as a number of pavilions and temples from the Ming and Qing. Altogether there are some 17 National Cultural Relic Protection Units in Ganzhou and 48 Provincial-level Cultural Relic Protection Units. Ganzhou Daily covers news about Ganzhou. China National Highways: G 105, G 206, G 319, G 323. Expressways of China: G45 Daqing–Guangzhou Expressway and G76 Xiamen–Chengdu Expressway. The Beijing-Jiulong Railway goes through Ganzhou from north to south, and it meets the Ganzhou–Longyan Railway (Ganlong line) at East Ganzhou Railway Station in Zhanggong District. Nanchang–Shenzhen high-speed railway is under construction. The terminal building of Ganzhou Huangjin Airport. The new Ganzhou Huangjin Airport, located in Nankang, was opened on March 26, 2008. Its name inherited from the old Huangjin Airport in Huangjin Town, Zhanggong District, which was closed since it was too close to the expanding Ganzhou urban area. It has domestic routes to Shenzhen, Guangzhou, Nanchang, Xiamen, Nanjing, Shanghai, Nanjing, Chongqing and Beijing. Nobel Laureate Gao Xingjian (Nobel Prize for literature in 2000) was born in Ganzhou. McAllen, Texas, United States, since 1994. Roissy-en-France, Val-d'Oise, France, since 2008. Freetown, Sierra Leone, since 2008. Brunswick, Georgia, United States, since 2008. Limeira, São Paulo, Brazil, since 2013. ^ 2011年全市主要经济指标 (in Chinese). www.ganzhou.gov.cn. ^ "世界橙乡"赣州创造脐橙销售奇迹 １１２万吨售空 (in Chinese). Jiangxi Times. 2010-05-25. Retrieved 2011-01-23. ^ "Contest Entry Notice for the Design of the Logo of "Ganzhou-World Capital of the Navel Orange"". Ganzhou Daily. 2010-01-13. Archived from the original on 2010-09-26. Retrieved 2011-01-23. ^ "Ganzhou the world's largest tungsten supplier". China Daily. 2007-12-21. Retrieved 2011-01-13. ^ "Ganzhou World's Largest Mechanical Clock". Ganzhou Daily. 2010-07-14. Retrieved 2011-01-23. Wikimedia Commons has media related to Ganzhou. This page was last edited on 15 April 2019, at 05:46 (UTC).